Lithuanian Talmudist; lived in the middle of the eighteenth century. He was dayyan and preacher in the community of Vitebsk during the rabbinates of R. Isaiah and R. Löb, and was known as one of the first Talmudic authorities in that part of Lithuania. He corresponded with many rabbis who consulted him on difficult ritual questions. 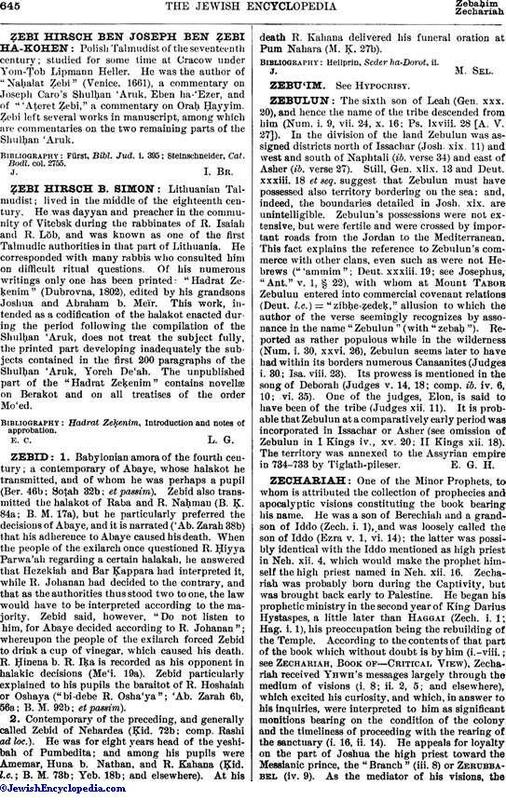 Of his numerous writings only one has been printed: "Hadrat Zeḳenim" (Dubrovna, 1802), edited by his grandsons Joshua and Abraham b. Meïr. This work, intended as a codification of the halakot enacted during the period following the compilation of the Shulḥan 'Aruk, does not treat the subject fully, the printed part developing inadequately the subjects contained in the first 200 paragraphs of the Shulḥan 'Aruk, Yoreh De'ah. The unpublished part of the "Hadrat Zeḳenim" contains novellæ on Berakot and on all treatises of the order Mo'ed. Hadrat Zeḳenim, Introduction and notes of approbation.